The table was almost full tonight at dinner. Our daughter-in-law, Coco, stayed home to get some much needed time to herself. She sent me a photo of her walk along the river with their dog. The rest of the family had converged on our new old gentle house in South Hadley Falls. Coco’s day was quiet and peaceful. Our day was delightfully raucous and filled with adventure. The grandkids had to explore the house. The went up to the attic first thing. As they had driven up and parked at the house, one of the kids exclaimed, “You didn’t tell us they lived in a 3 story house!” They have an attic in their house, but this house just looks really tall. After running around in circles in the one semi-finished attic room, they explored the basement, then the first and second floor. Then they discovered the playhouse. We now know the playhouse was built by Ralph, husband of Tammy, whose names were carved into the chimney in the attic in 1990. 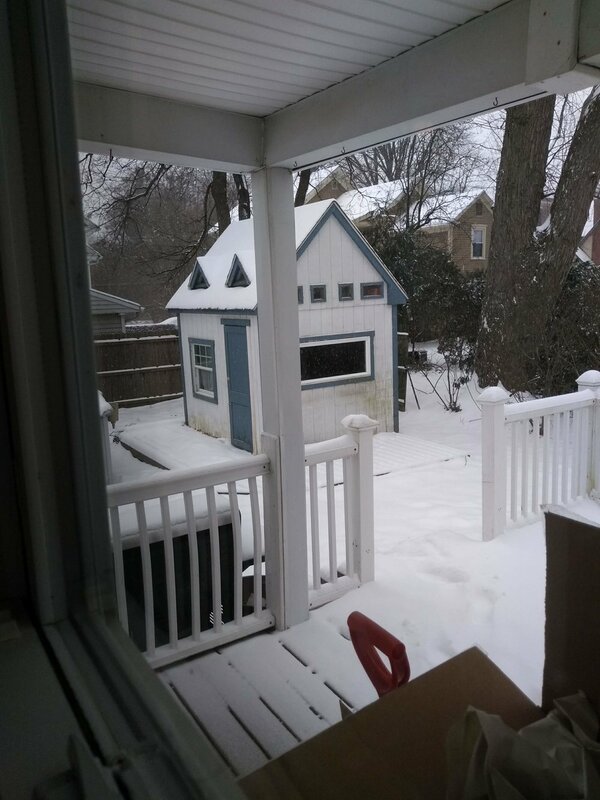 Ralph was a carpenter and the little playhouse is sturdy. It even has its own attic. What could be more exciting to our grandkids than to explore the attic in a playhouse! Lucien was the first to go up, lifted up by his Papa. Whoa… there were all kinds of things up there. By the time they were done exploring, they had found two boxes filled with old dusty Playmobil castle sets and pirate sets with almost all the pieces there and all in good condition, a skateboard, a snowboard, a razor scooter, and an original Kettcar pedal go-cart. Oh, and a nerf gun. How could I forget the nerf gun. All this kept them occupied until lunch. Then we took off and explored the neighborhood. We found a library (closed till Monday) and a park (closed till May). We found lots of snow with crusty ice which was almost as good as ice skating, which is to say it was just as slippery and we each fell at least once. We also found the Falls. At home, the kids were out on the front sidewalk with the Kettcar. Our neighbor, Richard, came over with some sleds for them, explaining that his grandchildren are skiing now, so they’re not into sledding anymore. It was a day of treasures for everyone. Patrick and Tamara explored the city. Emma had a lovely visit and lunch with Morgan, her classmate from elementary school. John was able to treasure some time with the children all playing happily with no tears or fighting. And with everyone here, our new house really feels like our home. That’s the best treasure of all!